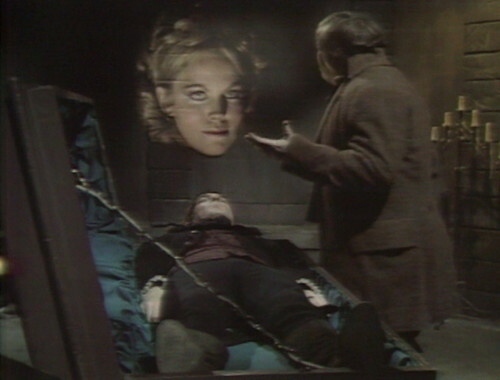 Barnabas decides that he needs to see Josette one more time before he dies. Ben thinks he can talk Barnabas out of doing something stupid, which is adorable. 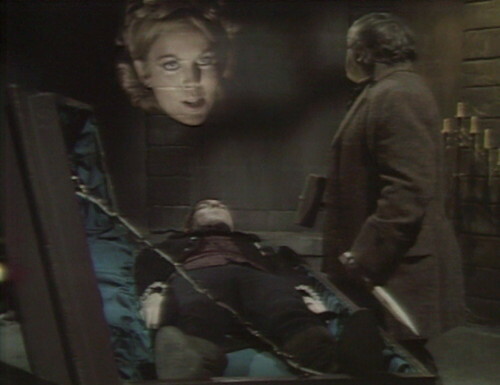 Ben: She thinks you’re dead, Mr. Barnabas. Let her keep on thinkin’ that, for her sake. 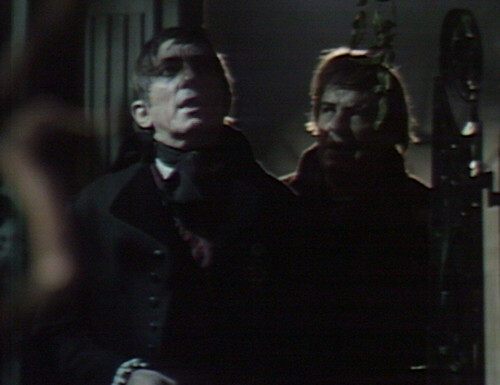 Barnabas: I only want to look at her. I only want to go to her room while she’s sleeping, and look at her. Oh, okay — when you put it that way, it sounds like a totally rational thing to do. Ben’s “Jiminy Cricket at the Gates of Hell” routine goes into overdrive. Ben: What if last night happens all over again? What if you do the same thing to Miss Josette that you did to that girl? 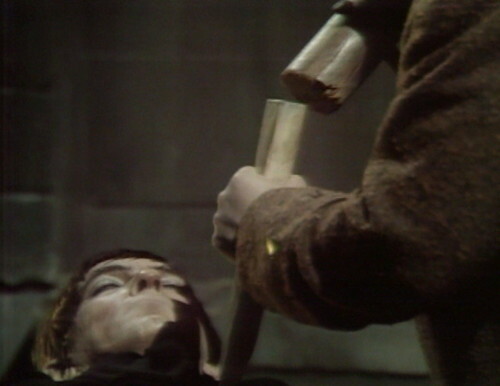 Barnabas: I would never harm Josette. Ben: You didn’t mean to harm that girl, but you did! Barnabas: She was not Josette! Ben: You might not mean to harm Miss Josette, but you might not be able to help yourself! 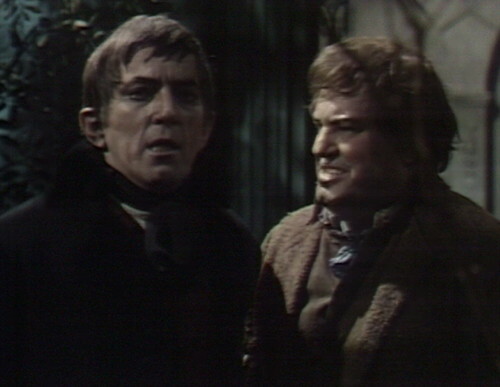 Ben: It’s not nonsense, Mr. Barnabas! Don’t go near her! Please! PLEASE! Next thing you know, we’re in Josette’s room, and we hear the squeaky-magic-marker sound that means something crazy is about to happen. 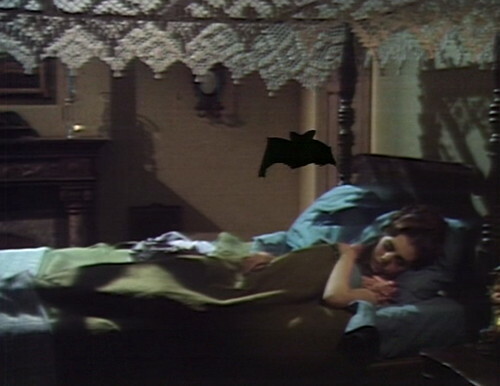 We see a flappy bat silhouette, and then Barnabas appears. He stands by her bed, and does a little thinks monologue. 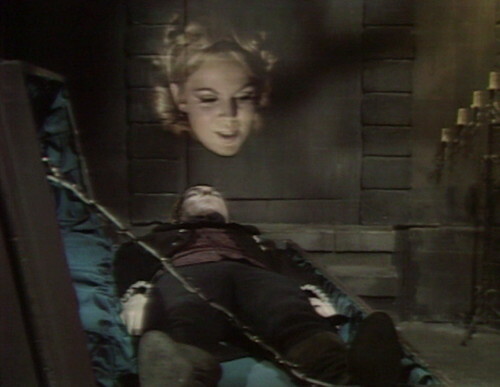 Barnabas (thinks): My dear Josette… I mustn’t awaken her. I mustn’t go any nearer to her. I mustn’t! I mustn’t! But Barnabas is really bad at obeying his own mustn’ts. He walks over to the bed, and then it’s more thinks, and more longing, and more eye makeup, and nothing really happens. Considering we just saw a bat turn into a guy, it’s a surprisingly dull scene. But then Josette’s aunt Natalie comes in, and sees Barnabas. He disappears in a puff of Chromakey. And now we’ve got another long argument scene, with Natalie trying to persuade Josette to leave Collinsport and go back to Martinique. So here’s the question for the audience: What are we supposed to want right now? The story is obviously waiting for something to happen, but we don’t want any of those things to happen. We don’t want Ben to stake Barnabas. We don’t want Ben to persuade Barnabas to stay away from Josette, and we don’t want Natalie to persuade Josette to leave. Any of those things would be the smart thing to do, but they would make the show more boring, so we don’t want them to be smart. At this point, if anybody in the cast started acting like they have a functioning brainstem, the whole story would collapse. Everything in this episode is trying to pull us away from the story that we know still has to be told. So how are we supposed to feel, watching all of these angst-ridden scenes about Barnabas saying goodbye to the moonlight, when we know it’s not going to happen anyway? There’s even a long scene of Ben urging Josette to leave Collinwood, which is one of those things you get when you have a limited number of actors per episode and you don’t want anything to happen. Everyone has to pair up and talk things over. Then our old friend the Convenient Rooster crows, signaling that it’s almost dawn. 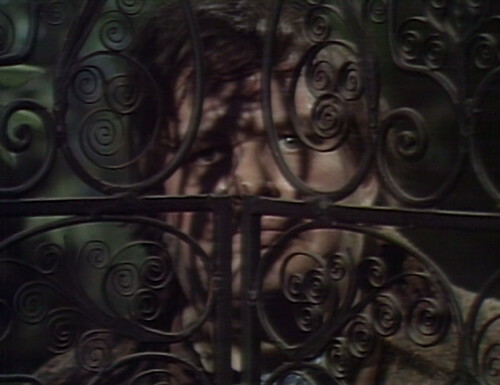 Ben looks through the gate on the Collinwood patio, and engages in thinks. Ben (thinks): In a few minutes, it’ll be light… and I’ll have to find a stake and drive it through his heart. Wait a minute. It’s almost dawn, and you haven’t found the stake yet? You’re supposed to chop down a holly tree! Plus the cemetery is five miles away from Collinwood, most of the time. You are way behind schedule. But finally, we get everybody assembled in the mausoleum, as Ben the Vampire Slayer prepares to do the thing that Must Not Be Done. And then who should show up in the nick of time, but Angelique, making another surprise supervillain entrance. Ta-DAH! And it doesn’t work. I hate to say it, because I love Angelique, and the central role she’s played in making this storyline interesting for the last three months. But it’s too soon. She’s only been dead for a week; you can’t expect us to be delighted by her surprise return. They need to give us a break from her for a little while, so we get a chance to miss her and wish they’d bring her back. It’s like that early-70s season of Doctor Who when the Master was the surprise villain for five stories in a row. You can’t go steady with a surprise like that. You and the surprise need to start seeing other people. Anyway, it’s not super clear what’s going on here. Is Angelique still alive? Is this a ghost? Or is it just a recorded message, powered by the curse? Three straight Sproat scripts. Damn it. And this was number two; there’s another one coming up tomorrow. I don’t know if I can do this. I might need to come up with a backup plan. Tomorrow: A Dark and Stormy Night (Backup Plan, part 1). At one point in the Ben/Josette scene, they get mixed up about which camera is supposed to be on the actors. First, the actors stand in a place where the camera can’t see them. Then they cut to another camera, and Josette immediately turns her back to the camera and stands in front of Ben. When Angelique chases Ben out of the secret room, the door doesn’t fully close behind him. 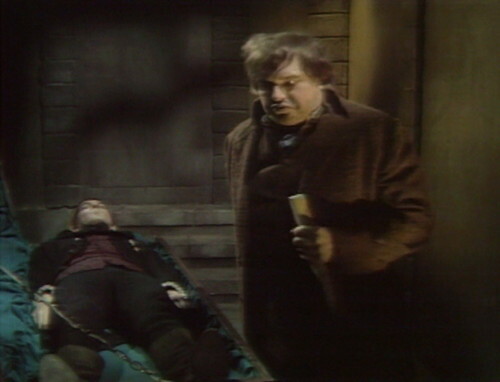 Trying to convince Barnabas that his plan won’t work… Good Luck! I know it can make for tedious viewing, but I think it’s important to see the characters at least TRY to make the right decisions and then fail, as opposed to them not bringing it up at all. 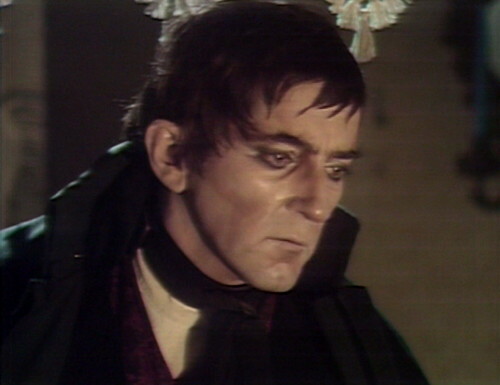 Barnabas knows he should stay away from Josette, should destroy himself, etc. And he tries – but he can’t, either because of personal weakness, or outside influence (like Angelique). Ditto for Josette trying to leave. Despite that yes, as viewers we don’t want to see the less dramatic outcomes, at the same time I think we do want to see them at least try for the more noble alternatives (and then silently cheer when they fail). 1795 is considered more tightly plotted than the more free-form 1897 or 1840, but I think there’s a definite lull where one story arc clearly ends (Angelique’s Tragedy*) and another has not yet begun (whatever Vicki is doing is hardly a “story”). *Angelique’s story plays out like Shakespeare — she’s the villain protagonist who wants something, briefly achieves it, and then loses everything. I’ve stated that her “dream” stage (the period when things go right for her) is somewhat brief — Barnabas discovers the truth about her pretty quickly. It would have been nice to see her actively trying to protect what she’s built (including working with Trask and Abigail against Vicki) and almost becoming a true Collins for a while. I imagine they wanted to get to the vampire section of the vampire origin story. Once that occurs, there really isn’t much of a story. It’s a low-key slasher film with the vampire killing people until there’s no one left. I think the writers realize this and ramp up the Heel Turn for Nathan Forbes — a bad guy who wants something and does things to get it. Comparatively, 1897 and 1840 don’t have similar lulls. 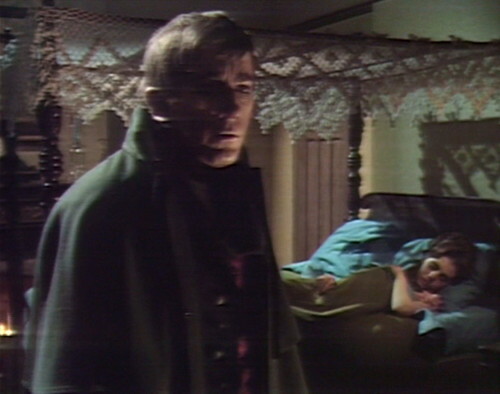 With the former, Barnabas is focused on saving David Collins, learning about Quentin, and so on until Quentin’s death is prevented. Then it shifts to stopping Petofi but there’s no lull. The story arcs overlap nicely. Same with 1840 and Judard’s vengeance against the Collins. I wish I could watch this show with 10 year old eyes again because unfortunately watching it now makes me realize how irritating Barnabas really is. He already admitted he was partly responsible for his sister’s death by wanting to see Josette ‘one more time’. Suppose this time his mother looks out the window..or his young cousin Daniel or even Josette herself?? Also I agree about bringing Angelique back too soon. The trouble with trying to provide a major cliffhanger like this every week (or even every other day) is that these event begin to cancel each other out and become mundane. What I tended to like about the early DS episodes is that although the storylines moved along at a slower pace the eventual ‘money shots’ (such as seeing Bill Malloy’s body floating at the base of the cliff or Dr Guthrie crashing his car into a tree amid the flames created by Laura Collins) are that much more dramatic and powerful. Yes, I do find Barnabas’ decisions quite irritating, but I prefer to give it a humorous slant. As “Barnabas does the work of three men: Curly, Larry, and Moe.” I did mange to write a DS continuation and kept him, but I demoted him from crisis management. I actually gave crisis management to someone competent who warns him that if he interferes, she will take him apart with a blunt nail file. 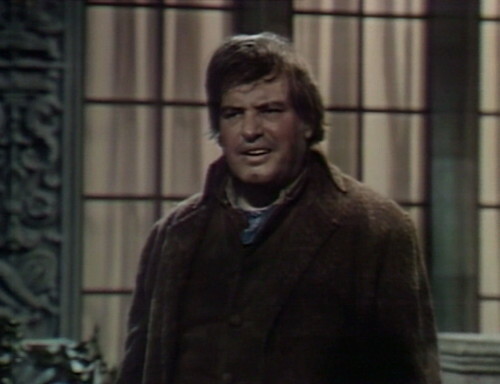 I mean, soap opera characters are supposed to make dumb decisions so that the action can stretch, but Barnabas is overdoing it… And on top of that, he’s in charge of Crisis Management, which is an invitation to catastrophe. I simply love it how they’ve gotten so confident with the Chromakey. Even though they screw up sometimes, it really gives the show a unique feel, having ghosts and vampires and what-not appearing and disappearing all over the place. In fact, the fact that it isn’t always all smooth and perfect is sometimes a plus — it’s another factor that gives the show the feeling that we’re watching a filmed stage performance, and so the fact that they’re pulling off ambitious special effects at all is exciting, much the way it is when you see ambitious special effects in a live theater production. I agree on Angelique’s return. That big laughing head was tiresome and way too soon. In general, I’m downgrading the whole Angelique experience. This time around in 1795, I’m more about Ben, Naomi and Joshua. Here’s how Barnabas could have been redeemed (at least a bit). Ben’s still refusing to make with the stake. Couldn’t Barnabas just walk his vampire self on up to Widows’ Hill and watch one last sunrise? He could strike a pose and soliloquize (while Ben pleaded for him to ‘come away, Mistah Bahnabaas’) until he exploded, or crumbled to dust, or turned into a skeleton with a wig and glass eyes, whatever. We feel better, because Barnabas tried to do something (BY HIMSELF) about the problem, even though he has a terrible track record for it. AND we hate Angelique for preventing it. See? There IS a way to make a Ron Sproat script EVEN LONGER! You might be onto something there, John E. However, I’m still enjoying this viewing of DS. I watched it during summers and on vacation in 67 and 68. I was in middle school. I remember when I had a series of dental appointments (I loved candy and didn’t like brushing that much) that required me to leave school early and walk downtown. I realized the school was about halfway between home and the dentist, so I continued the “dental appointments” for an extra week, walking home to see the show while my parents were at work. I watched during the summer before high school, then got too busy to continue. I don’t remember any plots, just the people, the costumes, and the pretty ladies with curls. I am pretty sure that Angelique isn’t chromakeyed, but she is matted into the video. She is wearing a black cloth covering her torso and is standing against a black background. The black is then keyed out and her image is superimposed over the master shot. It’s really the same effect they use for the closing credits, which are camera cards (or a scroll when they have the crawl credits). White (or yellow) lettering on a black background. One camera is focused on the cards and another on the closing set shot. The black on the cards is keyed out and the lettering is superimposed over the closing shot. Speaking of the closing credits — during the engineering strike, they only used the short version, all on camera cards (cast, Ohrbach’s, Curtis, Costello, director, writer, DCP logo). They would never use the long credits, which would have the names of the positions (tech director, lighting director, audio, video, etc.) that were being filled by management scabs. 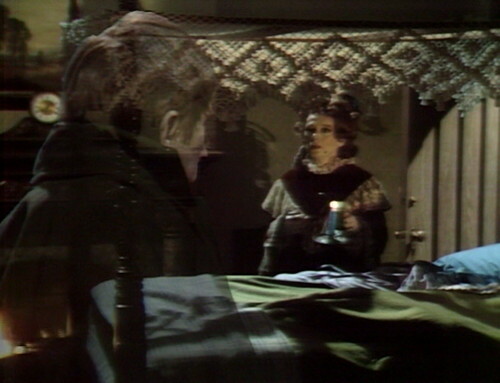 No one else puzzled by the fact that Barnabas can just vanish when Natalie walks in. If that is in his power, why does he keep turning into a bat to appear. Can’t he just cut out the middle man and appear and disappear at will. 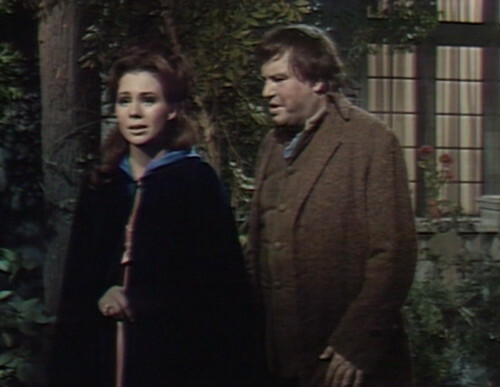 Natalie’s theatrical gasp on seeing Barnabas, and his ridiculous “if I turn around real fast maybe she won’t notice me” reaction, is hands down the most unintentionally hilarious moment in 400-odd episodes of unintentionally hilarious moments. So, this is my first time watching these storylines, so my knowledge of who-dies-from-what is rather limited. But, by any chance is Natalie’s fate also intertwined with the Collins’ family curse? Because if I were her, I’d be deeply troubled by the X-shaped melanoma that’s apparently just developed on the left side of her jaw in this episode.